Two men calling Maryland their home have kept the torch for doom burning long before its resurgence. One, Scott "Wino" Weinrich, has well received his come-uppance as a figurehead of the genre, yet riff machine "Iron" Alfred Morris, III has been playing the game for decades and his dedication is no less intense. Born from the ashes of long-ago rockers FORCE, Morris formed IRON MAN, initially a BLACK SABBATH cover band and since long-standing as a proponent of doom metal featuring original songs. 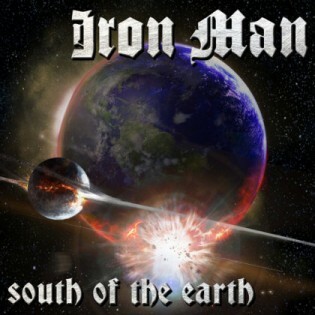 After what must have felt like a long ride to nowhere following years of locals-only appreciation, IRON MAN celebrates a quarter century and subsequently gets their due in the form of their debut for Rise Above/Metal Blade Records, "South of the Earth". This being IRON MAN's fifth full-length recording (they also have three EPs, a live album and a handful of demos to their credit), the timing couldn't be better for Morris to take his place in the limelight. His current cohorts, the funky Louis Strachan on bass, "Screaming Mad" Dee Calhoun on the mike and recent addition Jason "Mot" Waldmann on drums help lift Morris' enduring doom procedures to a hefty cadence. It doesn't hurt his cause to have Frank "The Punisher" Marchand (UNORTHODOX, DECEASED and BORRACHO) again working the console. Marchand was around for IRON MAN's 2009 album "I Have Returned", but he seems to know what's at stake here. Thus the dense and fuzzy "South of the Earth" benefits from thick pushes of all of the band's parts, creating a professional yet unpretentious doom bash. Yes, BLACK SABBATH, CANDLEMASS and SAINT VITUS have their hands in IRON MAN's plunged tones, but so does every other band on terra firma calling themselves doom. What's special about IRON MAN and "South of the Earth" is the expert static tugs yielded by Alfred Morris, III, who brings as much Clapton, Beck and Hendrix to his playing as he does Tony Iommi. You can hear all of them merged as one in "The Worst and Longest Day", "A Whore in Confession" and in the pedal-crushed aero ducts filtering throughout "Hail to the Haze". Morris opens "Half-Face/Thy Brother's Keeper (Dunwich Part 2)" with a nifty psych rake ala Jimi Hendrix before reverting to a vintage Iommi dragging riff pattern. His closing solo for "Half-Face" is so poignant, it feels jerked out of late Sixties' London. In this sense, Morris is a classic rock player housed inside a louder stable, one that proudly boasts a front man nicknamed "Screaming Mad". As such, Dee Calhoun's gruff chunks on this album are wolfish, whiskey-clogged set-ups for his swollen caterwauls, which are awesome in their volume. When hitting his full exhalations, Calhoun crudely punctures his sound space and strains the album's already gritty mix as grand finales or set-ups on the title track, "Hail to the Haze", "A Whore in Confession" and "IISOEO (The Day of the Beast)". Crude in this case is a good thing, since Calhoun keeps IRON MAN's pitch dirty no matter how polished Morris and Louis Strachan may be. Low-key riffs are fundamental to this band, yet Strachan's fusion and funk lines veer IRON MAN to the brink of explosiveness, even while checking down Morris. Calhoun's wails pushes the band right over the edge or he helps gouge a punishing verve out the gate as he does on "In the Velvet Darkness". On the killer closing number, "The Ballad of Ray Garraty", Calhoun reveals some nice verse cleans before the distortion pedals are crushed and he toughens up along with the booming choruses. 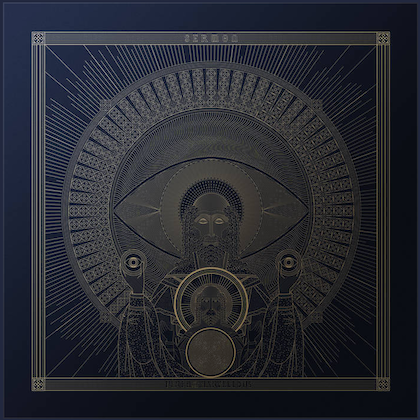 It's not just Morris' sumptuous instrumental "Ariel Changed the Sky" that legitimizes him and IRON MAN, but it feels like justified recognition, particularly once "IISOEO (The Day of the Beast)" gallops out with steady, massive buzzbombs, chucking bass plods and Mot Waldmann's squashing grooves. The exchange in moods between these two songs summons a fresh, gallant approach to doom even while remaining true to the genre's core ethos. Thus "South of the Earth" becomes Alfred Morris, III's deserved retribution. His faithfulness is inarguable and his supporting cast is top-notch. 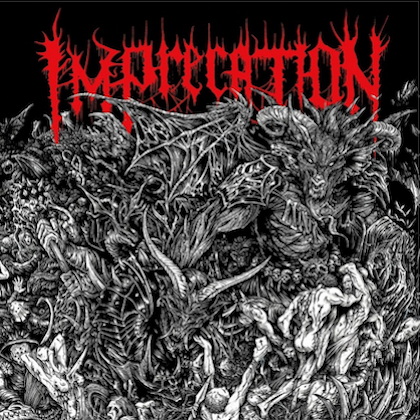 If you care anything about doom metal, this is one band you must give your attention to.